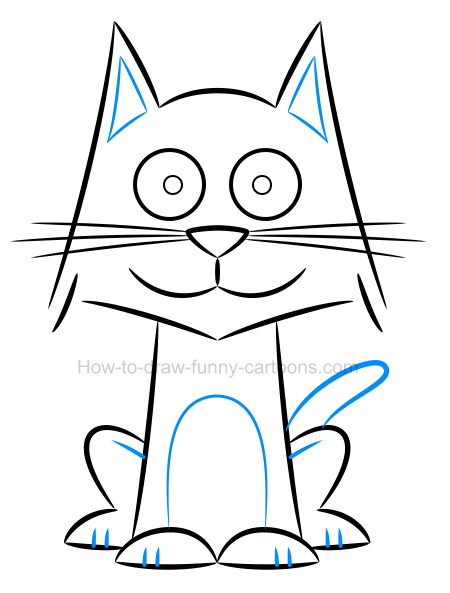 Create a simple illustration of a cat and then see how the same character can be used to create other cats made from various patterns and colors. Cats are lovely animals to illustrate. Probably one of the most popular subject on most social medias, everyone had the opportunity at one point to draw a simple cat using a few circles and triangles. Inside both ears, a small patch made from a triangle can be found. The top of the head can be made from a small curved line. The tip of both ears must be sharp and pointed. Both eyes and pupils are made from perfect circles. The mouth is represented by two long curved lines. Some hair can is visible near the cheeks of the cartoon cat. A bright patch was also added on the stomach of the character. Back legs are darker and filled with basic details. Front legs are made from a long oval shapes filled with two small lines. The body is thin and narrower near the neck. Don't forget to sketch whiskers using three long pointed lines. The nose is created from a small triangle made from round corners. Excellent! We all know what cats look like, but it's always a good idea to have a small reminder of all the things we need to draw before proceeding with the tutorial. Ready? 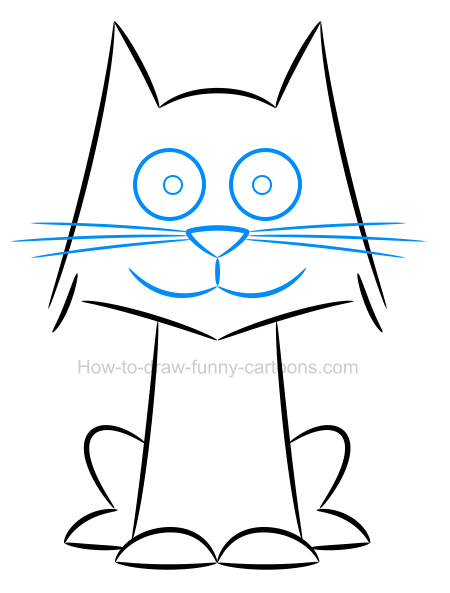 Let's create a beautiful cat in just a few easy steps. Drawing accurate proportions can be tricky, that's why it can be a good idea to sketch a few basic shapes to help us through the drawing process. Let's start with the head using a large circular shape. 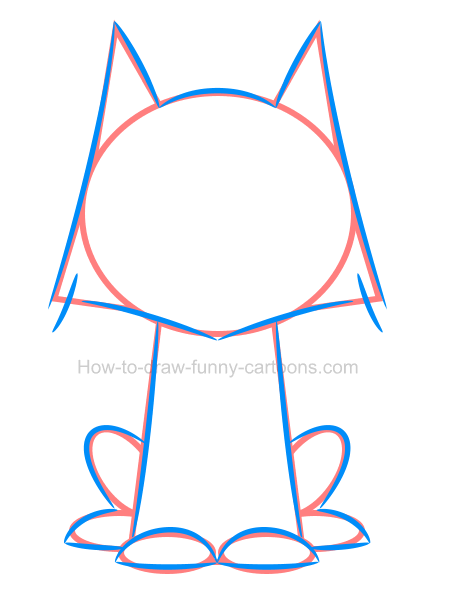 Then, you can draw the ears and the cheeks using triangles. The body is made from a long rectangle and all four legs are represented by small oval shapes as seen below. 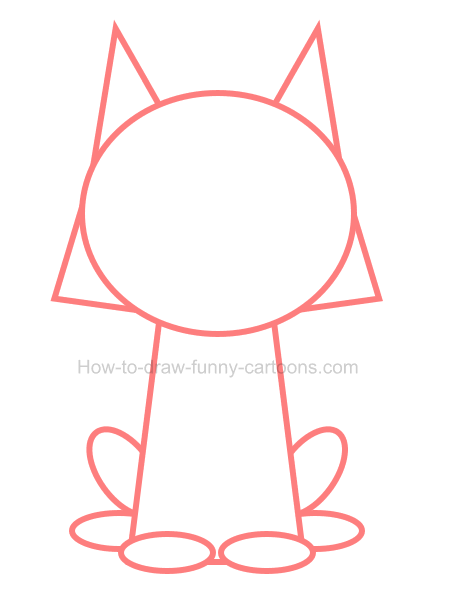 Now that we have a good template to help us draw this illustration of a cat, let's sketch some lines! I like to use a mix of curved lines that are short and pointed on both ends. Once the character is recognizable, you can erase all shapes created in the previous step (the ones with orange outlines). Draw two medium circles to form the eyes. The pupils are made using small dots. The nose is created from a triangle and whiskers are done using long sharp lines. For the mouth, you can start by sketching a small vertical line below the nose. Complete this step by drawing two long curved lines on the bottom of the head. 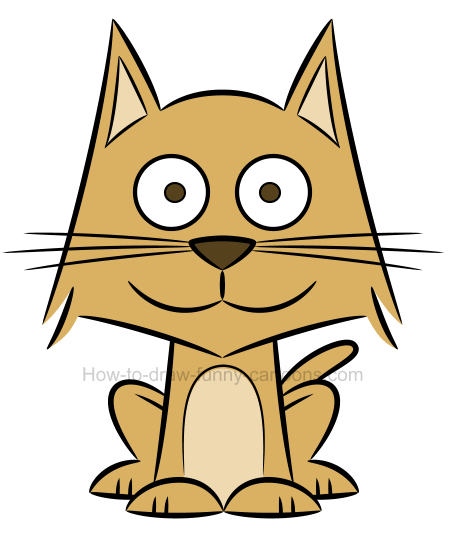 Let's complete this illustration of a cat by sketching details on the character. First, draw a small triangle inside both ears. Then, draw a tail on the right of the image using a curved line. A large patch can also be drawn on the stomach of the cartoon cat. Finally, draw small lines inside all four legs as shown in the picture below. step 5 - time to add some colors! 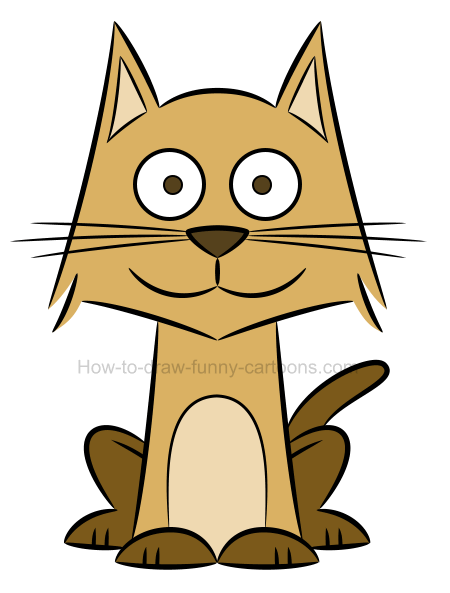 For this example, I have selected a brownish color inside the body, the head and the legs of the cartoon animal. The pupils and the nose are filled with a darker version of the same color. Of course, both eyes must remain white. Patches on the stomach and inside both ears can be brighter. Both back legs are also slightly darker to create a little bit of perspective. For all following examples, let's make all legs the same color and remove the "perspective" effect created using a different color. In this first example, only proportions were modified. The character is now closer to a kitten than a cat. The head and the legs are huge while the body feels small. For this second attempt, all four legs and the tail are now darker. This simple modification is enough to make the whole animal more dynamic and visually more interesting. 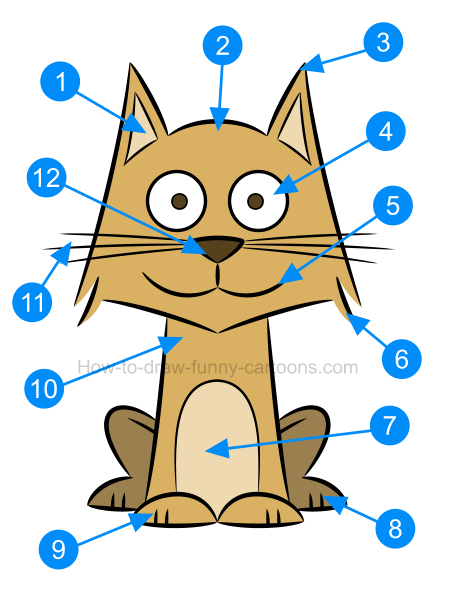 This is something that can also be found on real cats, which is even more fascinating! What if the new colors added on the legs and tail inside the previous illustration were added randomly using various patterns? Well, you would end up with something like this! This version is even more interesting because the character looks friendlier and is definitely cuter. Irregular patterns are always visually more challenging than regular ones. It can also be a good idea to draw a few stripes inside our illustration of a cat to create something unique and different. Just be careful to make sure that the character cannot be confused with a tiger. It's quite easy to see all differences between both characters in real life, but things are different inside cartoon images that are usually extremely simple and sometimes almost similar. Just try an other color ... like grey! Finally, you can simply choose to try another color and create a new version of the cat using this unique modification. This is a cartoon illustration, so you are not limited by just a few basic colors. 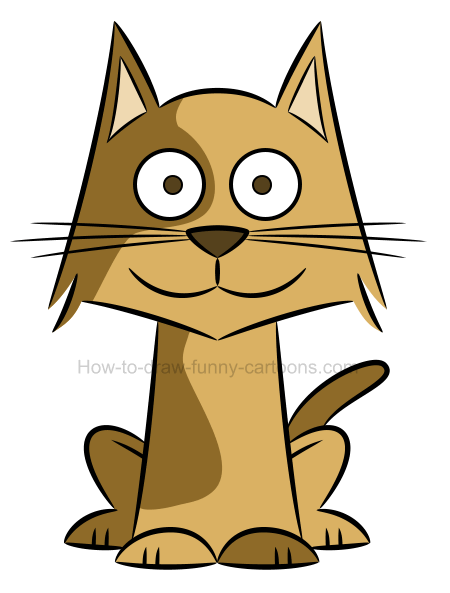 Your cat can be brown, orange, white, grey, black, blue, green or even red. Just be creative and have fun! Mix, experiment and have fun!